Fiat's Bravo may not seem an obvious choice in the crowded family hatchback range. However, think again. This is a small family car that’s stylish, affordable and easy to drive. The 1995-2002 Fiat Bravo was the funkier three-door little brother to the five-door Brava, whose foundations it shared and boasted a fairly comprehensive spread of engine options, both petrol and diesel. This compact hatchback showcases a great design with a simple interior that sticks to Fiat’s logical approach to styling. Newer models are even more handsome and benefit from better engines: three petrol, including a 90bhp 1.4 litre and two nippy T-Jet 1.4s at 120 and 150bhp and three diesel with two 1.6 litre MultiJet versions at 105 or 120bhp and a 1.9 litre which soon became a 165bhp 2.0 litre. While interior space isn’t the biggest, the Fiat Bravo is impressive on the inside as well as out. It’s furnished with high-quality materials that wouldn't look out of place in a far more prestigious, luxury brand car and is a comfortable ride for both driver and passengers. Trim levels will be familiar to Fiat owners, starting with the Bravo Active and Active Sport, on to the Dynamic and then the Sport as range-topper. It boasts exterior curves and a distinct front grille and alloy wheels, so you’re sure to get noticed for all the right reasons in one of these. Second-hand Fiat Bravos handle pretty well on the roads and are good to drive. Although it’s not the most powerful in its class, it’s overall performance can be deemed as nothing less than adequate. It’s a car that’s easy to drive, thanks to its simple dash layout and controls. This Fiat was an excellent buy when new and holds up equally well as a used purchase. 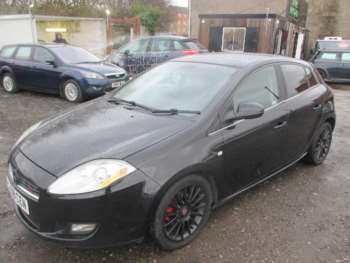 Got a specific Fiat Bravo model in mind?